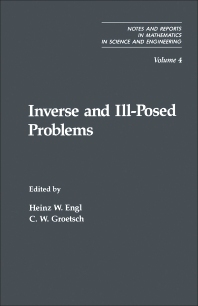 Inverse and Ill-Posed Problems is a collection of papers presented at a seminar of the same title held in Austria in June 1986. The papers discuss inverse problems in various disciplines; mathematical solutions of integral equations of the first kind; general considerations for ill-posed problems; and the various regularization methods for integral and operator equations of the first kind. Other papers deal with applications in tomography, inverse scattering, detection of radiation sources, optics, partial differential equations, and parameter estimation problems. One paper discusses three topics on ill-posed problems, namely, the imposition of specified types of discontinuities on solutions of ill-posed problems, the use of generalized cross validation as a data based termination rule for iterative methods, and also a parameter estimation problem in reservoir modeling. Another paper investigates a statistical method to determine the truncation level in Eigen function expansions and for Fredholm equations of the first kind where the data contains some errors. Another paper examines the use of singular function expansions in the inversion of severely ill-posed problems arising in confocal scanning microscopy, particle sizing, and velocimetry. The collection can benefit many mathematicians, students, and professor of calculus, statistics, and advanced mathematics.